A Khepera robot provided with infrared sensors evolved for the ability to find and remain close to a cylindrical object randomly located in the environment. 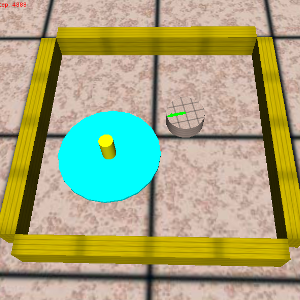 The discrimination of the two type of objects (walls and cylinders) is realized by exploiting the limit cycle oscillatory behaviour, produced by the robot near the cylinder, that emerges from the robot/environmental interactions (i.e. by the interplay between the way in which the robot react to sensory stimuli and the perceptual consequences of the robot actions). An iCub robot able to reach with its left arm any arbitrary target position in its peripersonal space by controlling 6 actuated joints (2 joints of the iCub’s torso and 4 joints of the iCub’s left arm). The connection weights of the robots’ neural controller are adapted through an evolutionary method on the basis of an evaluation criterion calculated on the basis of the distance between the left hand of the robot and the target location averaged over several trials in which the robot has to reach different target positions. 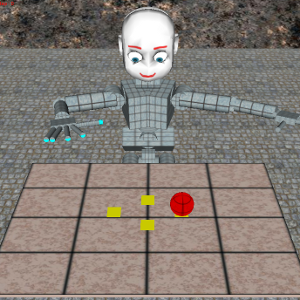 An evolved iCub robot displaying integrated reaching and grasping capabilities that enable it to reach a ball located in varying positions over a table, grasp it, and handle and elevate it. 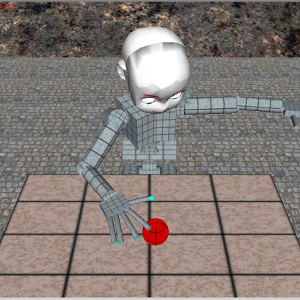 Beside the difficulties concerning the need to control an articulated arm with many DOFs, this represents a rather challenging task since it requires to interact with a spherical object, that can easily roll away from the robot’s peripersonal space, and requires to integrate three interdependent behaviour (reaching, grasping and lifting). 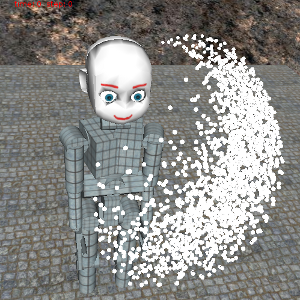 An iCub robot trained to display a reaching and grasping behaviour through a combination of kinestetic teaching, in which the robot tries to imitate the actions demonstrated by the caretaker who appropriately drives the robot arm-hand in a series of demonstration trials, and trial and error learning, in which the robot refine in skills on the basis of its ability to realized the goal of the action.